Troops in America have truly come home. The war is over. Wars rarely end to the same kind of fanfare with which they are launched. It is one thing to rush off and get holes blown through you, it is another to lick your wounds and quietly carry your fallen comrades home. Like all of them, but more so, the Iraq War was a horrible war. It involved the deaths of countless innocents. No class, creed, gender or age group was spared. No one was spared. Somebody casually mowed down a line of fish-frying stands along the river, killing all the merchants who had maintained them for years. Another madman blew up a United Nations building full of people bearing food and medicine. There were the burned U.S. contractors hanging from a bridge, macabre marionettes in Falloujah. The middle-aged female aid worker whose resume read like Mother Theresa's, kidnapped, videotaped in misery, and left to the side of the road with a few bullets in her. the highway scribe could go on, but as a practical and mechanical exercise, it would take more than a lifetime to chronicle the million little horrors that unfolded in Iraq over the past ten years. It would go on and on through the decades: the highway scribe sitting behind a manual typewriter as Iraqis came and recounted the way a bomb went off in the market where they were shopping, shattering their psyches forever, or about the family who misread the soldiers' signs at a checkpoint and were killed with machine-gun spray through their windshield. highwayscribery's allegiance has always been to the little girl playing with a kitten in the courtyard, and favors policies that ensure, at all costs, she is not the victim of violence cooked-up with special malice in some weapons laboratory. Such policies were not in evidence in Iraq. Opposition to the war was intense before it began. The country was split between those who saw an immature man in search of something easy to legitimize his shaky presidency, and those who thought the problems of the Arab world were just a few quick fighter-jet strikes away from being solved. These latter generated no great passion and the administration resorted to some "mushroom cloud" nonsense. They had only marginal success with that. Bush went ahead with the plan anyway. Colin Powell was the administration's Kabuki artist at the U.N. where he lied to the world and truncated his promising political career. The American left, lampooned and characterized as usual, hit the streets with dignity and impressive force. Large numbers came out to oppose the adventure and the president applauded our democratic state because they were "allowed to express their opinion," if not to necessarily have it acted on. There were brawls, arrests, and beatings between protestors and police, and citizen against citizen. The policy further widened schisms in American life, confirming the progressive lesson learned in the 2000 presidential elections: your vote and voice matter less than you thought. They bombed the crap out of the place. It was really something of a slaughter, even where the Iraqi army was concerned. Built up into "elite" cadres and "seasoned" outfits by a media constructing a narrative from embedded positions within the U.S. military, they turned out to be what would you might have expected prior to the PR blitz: A tinhorn operation with as much chance of resisting U.S. forces as the Washington Generals do of beating the Harlem Globetrotters. But this was a Republican project, the Democrats lamblike acquiescence notwithstanding. Once the president made an idiot of himself around the world by strutting on an aircraft carrier in pilot's suit and declaring "Mission Accomplished," there was no plan. The parallels between the government response to Hurricane Katrina in New Orleans and the post-invasion plan for Iraq are simple and direct. A party that disdains government, is actually quite poor at governing, administrating, and statecraft. So, in the early heady weeks, when administration officials swooped in to done flak jackets and collect a war photo for their personal collection, they made some rather careless, poorly developed decisions that opened up an insurgency. Especially in 2004 through 2006, Iraq became an inferno of massive civilian bombings that could kill hundreds, and ferocious battles like Fallujah that verged on extermination of the local peoples. 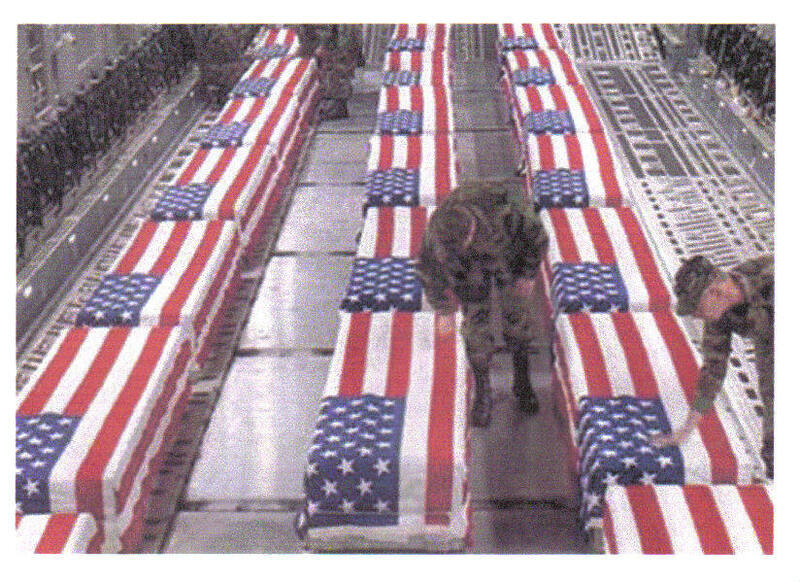 Some 4,500 Americans were killed. Another 38,000 flood the veterans hospitals now. It's the usual stuff, missing limbs, brain damage, wheel chairs, prosthetics, grim striving, vivid agony. The numbers and suffering of Iraqis were far worse. It is not at all ironic that they had no say in whether their country should be invaded in a fashion that was designed to "shock and awe." That is the logic of most wars. Some will play at it. Many more will suffer it. Little girl in the courtyard beware. There are no ticker tape parades as the troops trickle home, another clean-up job left to President Obama. We don't know if the work and money left behind will uphold and sustain a true democracy. Iraq reminds us that distinct cultures make homes of varying quality for civic life. Attempts to install the instruments of modernity run up the grain of very established practices and, unfortunately, may not be possible. In Iraq we must wait and see what the balance of our efforts their be. But maybe there is a quiet joy in the land, at least in the homes of those directly affected by the war, the people hired to fight it and the families left alone because of it. Nobody escape unharmed, that is certain, but people did escape and for them it is going to be a happy new year. The war's end should make it one for you, too.